Walking so fast you’re out of breath, sounds like something best saved for when you’re running late. However, scientists now suggest that raising your heart rate and moving those legs could do more good than you think. A brisk walk for weight loss or fitness improvement could be just the ticket in keeping you healthy and increasing your life span. It’s time to get your walking shoes on; these are the top three reasons you should consider increasing your pace with a brisk walk. When you walk briskly your heart rate rises. A slow dander will put you in the light intensity area, but a brisk walk moves that up to moderate; almost like going for a run. Once you’re in the zone, your body will have to work harder to keep up, and that means burning more calories, helping you stick to your fitness goals. The thing about brisk walking, unlike running, is that because your body isn’t under as much pressure as when you run, you’re more likely to build your endurance quicker––and this means more muscle tone. Besides, it also helps keeps your joints and muscles more supple, and that flexibility means your body is less prone injury if you do make that small leap from walking to running. Yes, it’s true! Although all exercise will naturally increase your lifespan, the same as unhealthy behaviors such as a poor diet, smoking and drinking will lower it; fast walking could have some unique benefits all its own. The University of Sydney, Australia found that people who walk faster have a lower mortality risk, especially affecting cardiovascular mortality, which is good news for all of us who like to get out and about. Pace––how fast is a brisk walk? What one person considers fast, another may consider slow. Usually, our walking pace is decided by the span of our strides (factor: height), the pressure of our step (factor: weight), and overall muscle tone. 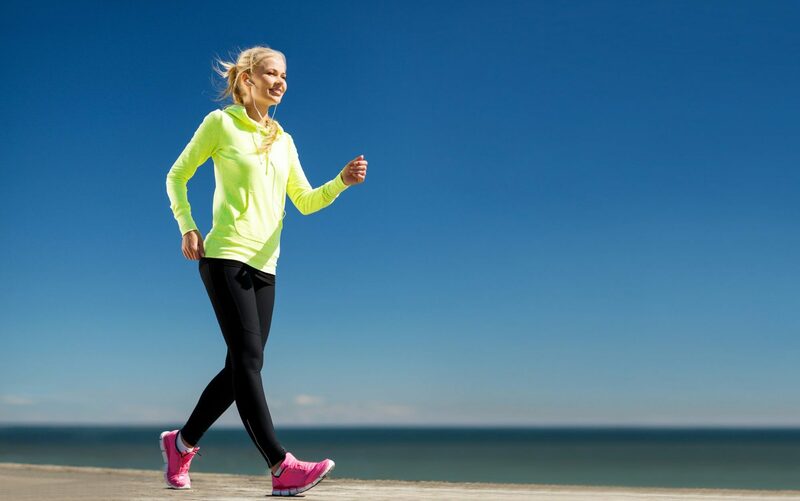 In a study on power walking benefits, the University of Sydney defined fast walking as around five or six kilometres per hour (3.1-4 km/h), however Professor Stamatakis, one of the key scientists in the study, highlighted that this is dependent on a number of other factors such as the walker’s general fitness levels. Feeling an extra “ba bum” in your chest? That’s normal. When you walk faster, your heart rate should feel increased. Take a deep breath; you’ll need it. Another sign that you’ve crossed the threshold into brisk walking is you’ll feel a little out of breath. Time to sweat. With all that exercise, you’ll know you’re in the zone when you have some sweat. As if living longer wasn’t enough here are some of the great reasons brisk walking benefits you. We spend way too much of our time cooped up indoors, be it the office or the home; aside from helping you live longer, one of the best benefits of speed walking is being able to take in the sights as you go. Choose your route in advance to take in some beautiful nature or simply explore a new area of your city or local neighbourhood, at the end of the walk you’ll be a little richer for it. Inside air conditioning and sitting in the house can leave you feeling tired, bored and down. Another great benefit of brisk walking is being able to get out and clear your lungs with some fresh air. While the city may not be ideal for the freshest of air, by taking a short trip outside the city boundaries, you’ll be amazed at how much better you feel. When you exercise, your body releases endorphins, dopamine and serotonin, these are chemicals associated with feeling happier, both in the long and short term. So, as soon as you hit the streets––or parks, or beaches, wherever you fancy–– their effects will kick in. Dopamine is the happiness hormone; it reacts when a reward is at hand giving you energy and keeping you going. Serotonin, on the other hand, is responsible for sleep cycle regulation, appetite control, and generally making you feel good. Combined these chemicals leave you feeling happier and healthier. 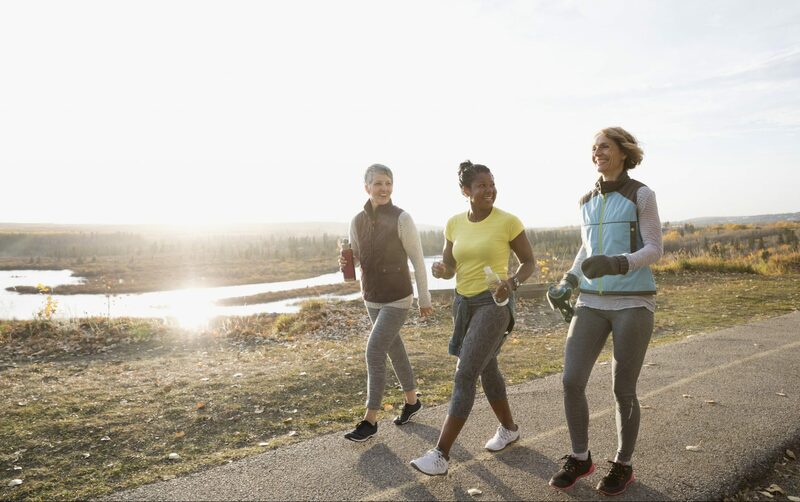 While you may have heard that running is the be all and end all in training for fitness, brisk walking can be an effective lower-impact activity that can help you reach your fitness goals effectively. Fast walking aids you in warming-up and stretching your muscles, so you’re less likely to suffer from an injury. Plus it’s also a great way to prepare for a marathon or other huge sporting event, especially if you can’t sit still on your “rest” days and need a low-impact activity to fill in the gaps. Health and sightseeing benefits aside, as you increase your walking pace and your training you be more fit, healthy and able. This provides you with the possibility to participate in more activities and get to where you need to go faster and easier. This mobility will improve your overall quality of life, and the longer you keep it up, the longer its effects will last.